A growing group of customer experience professionals are working hard to make some of life’s most frustrating experiences not just tolerable, but delightful. There aren’t many people who look forward to scheduling an appointment with the cable company. You’re typically given a 3-4 hour window to wait at home for something that takes just a few minutes. That is if they arrive on time, or even at all. A wasted day, and an irate customer to boot. Fair or not, the cable industry is the poster child for sub-par customer service. Kimberly Edmunds is working to change this experience. As the SVP of Customer Operations at Cox Communications, Edmunds is in a newly created position (as of April 2010) helping to provide a seamless service experience across all of Cox’s customer touch points. And she’s not alone in this mission. Edmunds was one of 180 customer experience professionals on hand in Boston last month for the inaugural meeting of the Customer Experience Professionals Association (CXPA). The CXPA is organizing a tribe of customer experience professionals dedicated to helping organizations rethink business through a customer-centric lens. Quite simply, they believe that good customer experience is good business. It may be fitting that the group met in Boston, just steps away from where the Sons of Liberty sowed the seeds of the American Revolution. (Yes, before he was named for a beer, favorite son Sam Adams was an anti-tax rabble-rouser. Pity the cable guy who showed up late at his brownstone.) The CXPA is hoping to usher in a business revolution of its own. 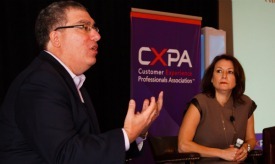 “Most organizations don’t understand the specific impact customer experience has on their business,” said Bruce Temkin, cofounder and chairman of the CXPA (pictured, with cofounder Jeanne Bliss; photo courtsey CXPA). Temkin spent 12 years at Forrester Research focused on customer experience, and is currently the managing partner of the Temkin Group, a customer experience research and consulting firm. He and CXPA cofounder Jeanne Bliss are on a mission to formalize the discipline by bringing together its most passionate members. They have clearly tapped into something. The association, formed in April 2011, has already grown to almost 1,000 members. The inaugural event featured attendees from brands including Sprint, UPS, LexisNexis, Stowe Mountain Resort, and Rue La La. Temkin also has the numbers to back up the growing demand for customer experience. The State of Customer Experience Management 2011 report shows that while only 7% of organizations consider themselves a customer experience leader today, 61% aspire to be a leader within three years. While customer experience isn’t a new concept, organizations are just starting to formalize the people, processes, and technology to make it all happen. It turns out there’s a reason why really good experiences are hard to come by. They take a lot of work to create and manage. The speakers shared top challenges which include executive support, clearly defined goals, organizational culture, and connecting the dots across internal departments. They talked of “silo dysfunction” and the notion that an organization’s structure is often the biggest hindrance to delivering exceptional experiences. Diane Simmons moved from a role on Fidelity Investments’ web team to her current position of VP of Customer Experience. One of the first things she did was pick 40 folks from across the organization to become what Fidelity calls Voice of the Customer ambassadors. The entire team took a field trip to Walt Disney World in Orlando, which has a program to train you in the magical ways of Disney customer experience. In addition to continuing their day jobs, the ambassadors are expected to spend a few hours per week identifying customer experience issues, providing feedback on products, and evangelizing the role of customer experience to others. It’s a grassroots-driven approach to change the culture starting with the folks who provide the best examples of great service in action. Organizations hope the result of all these efforts are deeper customer loyalty, better customer experiences, engaged employees and ultimately, a better bottom line. Not to mention a cable guy who shows up on time. Jeff Cram is Chief Strategy Officer and co-founder of ISITE Design, a digital experience agency. Jeff resides in Boston where he passionately roots for his beloved Red Sox.